You are here: Home » Hillary Email Points to New White House Bid? Hillary Email Points to New White House Bid? 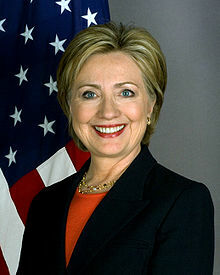 A new fundraising email from Secretary of State Hillary Clinton’s 2008 presidential campaign has “revived speculation” that she is still interested in winning the White House, according to Paul Bedard of U.S. News & World Report. “While her campaign has in the past dispatched fundraising emails in a bid to finish paying her 2008 campaign debt, the timing of the latest blast raised some eyebrows,” Bedard writes in his Washington Whispers column. The mail comes amid denials from the Obama administration that the president is considering replacing Vice President Joe Biden with Clinton on the 2012 ticket, Bedard observes. It also comes as a new poll by Washington Whispers shows Hillary as the clear favorite of voters seeking a third-party candidate. In the survey, 39 percent of respondents chose Clinton as their choice for an independent candidate, well ahead of Mike Huckabee at 20 percent. Together, we made history in the last presidential election. From Hillary’s speech at the Democratic National Convention, to the work and support that each of us brought to the campaign, that story lives on — in the history books, in our memories, and in the mementos that commemorate that time . . .
As we all know, campaigns are tough, but having loyal supporters like you helped make Hillary’s campaign one that will never be forgotten. All contributions will go to paying the last of the expenses the campaign incurred while making our historic stand. Contribute today to receive one of the last commemorative campaign DVDs or another one of our last few items. Asked about Hillary’s political aspirations during a recent appearance on “The View,” Bill Clinton responded: “I don’t know what the future holds.